Formerly in the county of West Lothian, South Queensferry lies on the south shore of the Firth of Forth, 10 miles (16 km) west of Edinburgh. It has been an important crossing at least since 1071 when Malcolm III granted free passage at the 'Queens Ferry' for pilgrims on their way to St Andrews. A ferry service operated until 1964, the year the Forth Road Bridge was opened. South Queensferry was created a burgh of regality in the 13th century and made a Royal Burgh in 1636. It traded actively with Europe in the 17th century. Buildings dating from this period include Laburnum House, the Hawes Inn, the Tolbooth Tower, the Black Castle, the Old Parish Church and Plewlands House. St Mary's Episcopal Church (from 1441) was a monastery and hospice before the Reformation. 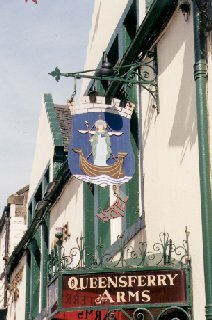 The Hawes Inn features in Robert Louis Stevenson's novel 'Kidnapped'. Today, South Queensferry is a dormitory settlement for Edinburgh and a yachting centre with oil storage and whisky industries. The immense Hewlett Packard research facility and electronics manufacturing plant, which opened in 1966 closed in 2010.